Lamborghini is one of the oldest players in supercar segment, amazing the Indian market with its world class performance products and exclusive designs. Huracan LP580-2 is priced at INR 2.99 Crore and comes equipped with a very powerful 5204 cc, V10 engine producing nothing less than 580 PS at 8000 rpm and 540 Nm at 6500 rpm. The engine comes mated to a 7-speed LDF dual clutch transmission. Lamborghini claims a top speed of 320 kmph for their supercar while it takes 3.4 seconds to sprint from 0-100 kmph. Claimed mileage for the Huracan is 8.42 kmpl while it is a proper two seat sports car with just 1180 mm of overall height. 2017 Nissan GTR was launched at INR 1.99 Crore in India. It is one of its kind product with higher performance and a normal car's stance. It has an overall height of 1370 mm while the car takes just 3 seconds to sprint from 0-100 kmph. Nissan GTR has a top speed of 315 kmph while it's 3799 cc, V6 engine comes with twin turbochargers. The setup generates 570 PS and 637 Nm of torque while the engine comes mated to a 6-speed dual clutch transmission. GTR has a huge fan following in India while Lamborghini cars are known for their exclusive designs. 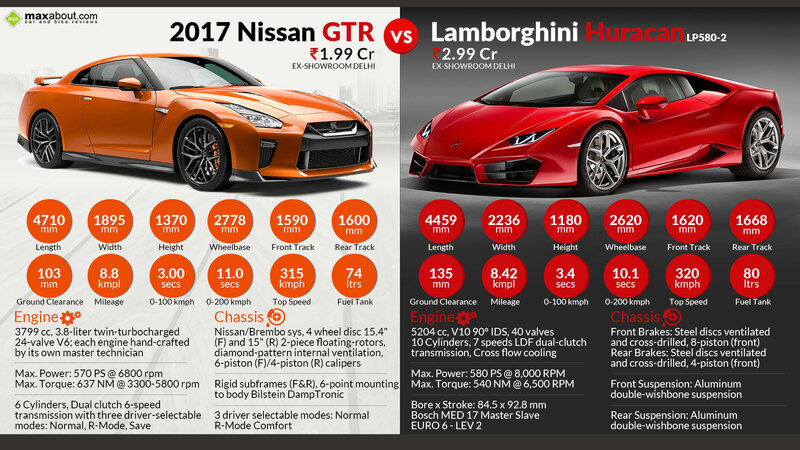 Both the cars are brought into India as CBUs, hence justifying the huge price tags. Click here to know more about Nissan GTR.